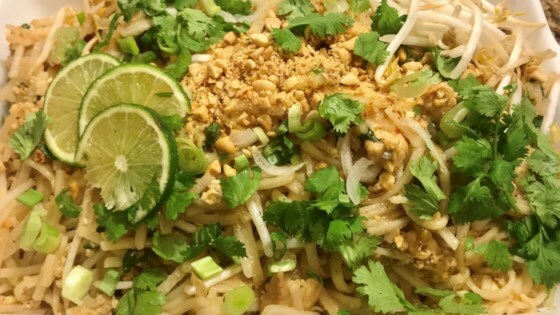 "This is a traditional Pad Thai recipe used by a friend's mother. You can use chicken, pork, beef, tofu, or a combination. You may want to start with less pepper, and work your way up." Soak rice noodles in cold water 30 to 50 minutes, or until soft. Drain, and set aside. Heat butter in a wok or large heavy skillet. Saute chicken until browned. Remove, and set aside. Heat oil in wok over medium-high heat. Crack eggs into hot oil, and cook until firm. Stir in chicken, and cook for 5 minutes. Add softened noodles, and vinegar, fish sauce, sugar and red pepper. Adjust seasonings to taste. Mix while cooking, until noodles are tender. Add bean sprouts, and mix for 3 minutes. Crowd-pleasing Thai noodles you’ll love!